Should we remove the concrete from White Oak Bayou? That’s an interesting question, one worth considering, if there’s a way to pay for it. A feasibility study conducted for the Harris County Flood Control District and released Friday offers three options to do just that. What it does not offer is a way to pay for the three alternatives, which range from $30 million to simply remove the concrete to $60 million to re-contouring the channel to connect the bayou with publicly owned parks and open land above and below the waterway. The question is particularly significant after Hurricane Harvey laid bare weaknesses in the local flood control system: nearly 180,000 buildings exist in floodplains, a handful of channel widening projects are halted with lack of federal funding and the flood control district struggles to stretch $60 million every year to service a county of more than 4 million people. 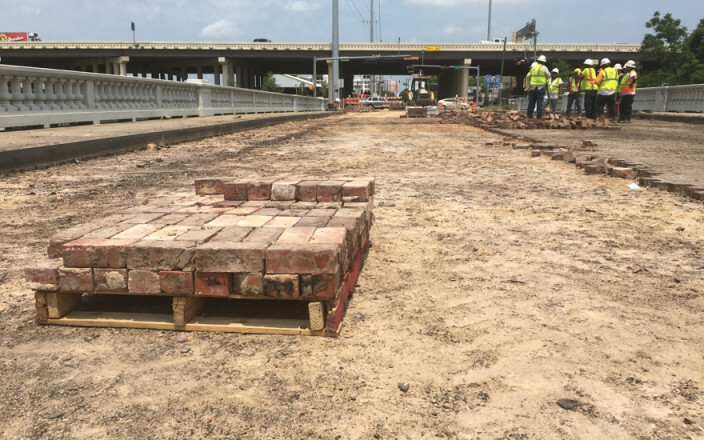 If the concrete removal is pursued, it would be the first such attempt to revert dozens of miles of concrete-lined channels that crisscross Houston to their natural aesthetic, building on recent widespread momentum to undo the utilitarian past. The concrete was laid as part of a massive flood control effort in the middle of the last century to straighten and channelize the bayous with an eye toward speeding stormwaters’ rush downstream, eventually to the Houston Ship Channel and Galveston Bay. The idea of removing the concrete and restoring the bayou to a more natural state comes two years after a $58 million project created 160-acres of green space near downtown in Buffalo Bayou Park. That project was paid for largely through private donations, including a $30 million catalyst gift from Kinder Foundation in 2010. The flood control district contributed $5 million. For White Oak, however, it’s unclear who would pay for a bayou project that would take several years to complete and cost at least $30 million without significantly reducing flood risks. 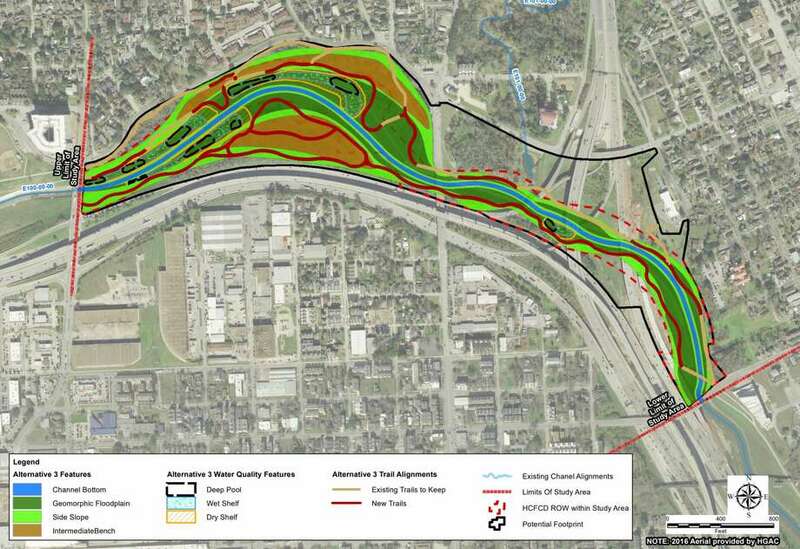 The feasibility study presents three alternatives for a portion of White Oak Bayou between Taylor Street and Hogan Street: simply removing the concrete and excavating the channel; removing the concrete and connecting the bayou with city park space north of the bayou; removing the concrete and connecting the bayou to both the city park land and land owned by the Texas Department of Transportation to the south. The first and cheapest option would cost roughly $30 million, the middle about $42 million and the most expensive option around $60 million. Sherry Weesner, administrator and president of the Memorial-Heights Redevelopment Authority, which paid for the feasibility study said the group wanted to make sure, if and when the flood control district considered replacing the concrete, that it examine the idea of removing the concrete, as well. Weesner said the authority currently does not have funding to pay for even the cheapest of the three proposals. You can read the full report here. I think there’s value in doing this, but it’s hard to argue that it should have priority over any flood mitigation work. Maybe if the MHRA can raise private funds to cover a portion of the cost, as was the case with the Bayou Greenway Initiative, or if it can be tied to a flood mitigation project, then this would make sense now. Otherwise, it’s probably something to file away for another time. Voters in the Heights will likely have the opportunity to further loosen alcohol restrictions in the neighborhood this November now that activists have secured more than the 1,500 signatures required to get a measure on the ballot. When Houston annexed what was the incorporated city of the Heights in 1918, the boundaries of the city evaporated. Because of election rules the only residents who were allowed to vote on the matter last November had to live in the same voting precincts of those who voted to go “dry” back in 1912. A Harris County Tax Assessor-Collector & Voter Registrar spokesman said those precincts were 0053, 0057,0075,0054,0058,0086,0055,0059 and 0501. It’s speculated by Brain Poff, with Texas Petition Strategies, the firm who helped gather the signatures needed for last year’s vote and just finished with the petition for this fall, that the same will hold true this November for the ordinance to repeal the private club model. See here and here for the background. I feel pretty confident saying that if the original Heights booze referendum was on your ballot last year, then it will be on your ballot this year. The only real question at this point is how many other things will be on there as well. I look forward to seeing how this campaign unfolds. Heights voters last fall lifted a 105-year-old ban on the sale of beer and wine at grocery stores, but customers still must join a private club if they want to drink alcohol at area restaurants or bars. That means submitting a drivers license for entry into a club database. The Houston Heights Restaurant Coalition petition would lift that requirement, leaving the historically dry portion of the Heights nearly wet. Liquor sales at grocery and convenience stores still would be banned. Morgan Weber, co-owner of Coltivare and Eight Row Flint, said allowing restaurants and bars to sell alcohol more freely would improve the customer experience and help streamline operations. Weber also pointed to Texas Alcoholic Beverage Commission rules that require restaurants and bars looking to sell alcohol in dry parts of the Heights to establish a separate non-profit or association to receive the proceeds of alcohol sales and pay for the private club’s operation. See here for coverage of last year’s effort. I supported that effort (though I couldn’t vote for it, as I don’t live in that part of the Heights), as I generally support efforts to undo dry restrictions. This particular restriction is kind of silly – as noted in the story, restaurants can sell booze, they just have to collect your name and drivers license info for their “private club” to do it. I’m sure there will be opposition to this – I knew plenty of people who were against last year’s referendum, and I doubt they’ll be any happier with this one – though Bill Baldwin won’t be leading it. My early guess is that it will succeed if it gets to a vote, but we’ll see. Swamplot and Eater Houston have more. Heights area residents woke up Tuesday to a bright sunny day in more ways than one, finding that crews had opened the new Yale Bridge spanning White Oak Bayou. The opening late Monday is roughly 10 months ahead of the original schedule laid out by Texas Department of Transportation officials when the old bridge closed in April. During the lengthy detour, traffic often bottled up along Heights Boulevard between Interstate 10 and Allen Parkway. The new bridge has two lanes in each direction and eight-foot sidewalks on each side to accommodate pedestrians and bicyclists, separated from vehicles by a metal railing. Lighting and railings on the edges of the bridge mimic those from the original bridge. See here for the background. We were actually expecting it to reopen in February, so this is even earlier than we thought. Isn’t it nice to get some good construction news every now and then? Swamplot has more. Christmas 2017 is coming very early for Heights area commuters, now that transportation officials have confirmed that the new Yale Street bridge will open in early February – roughly 10 months ahead of the previous schedule. “They’re working fast,” TxDOT spokesman Danny Perez said Friday, acknowledging the accelerated opening day. Replacing the Yale Street bridge near the Heights has snarled traffic, which is already impacted when trains block the Heights Boulevard crossing. Without Yale, traffic has poured onto Heights, sometimes backing it up to Allen Parkway. Progress on the span has moved at lighting pace. By mid-November, the support beams were in place and workers were forming the steel rebar. This week, the concrete deck that will be paved for the road was coming together. The schedule – which included expectations that materials and weather would hamper work – was based on established criteria. Construction, however, never ran into serious delays and steel, concrete and other materials were never in short supply. See here for the background. It’s good to know that every once in awhile, karma works in your favor. The construction has caused a lot of congestion on Heights Blvd around I-10, and I’m sure I speak for many people who have to slog through that when I say that I am delighted it will soon get a little better. Laying out the particulars for a new trail section along White Oak Bayou, Chip Place saw something out of place where the trail crossed the Heights Hike and Bike Trail near T C Jester. It was the stairs connecting the two trails. Starting Friday, the stairs – along with two miles of fresh trail to southeast of T C Jester – are ready for runners, cyclists and others who want a new view of the area. “It is always fun to create a park and see how people will use this,” said Place, managing director of capital programs for Houston Parks Board, the nonprofit that promotes parks in the city. 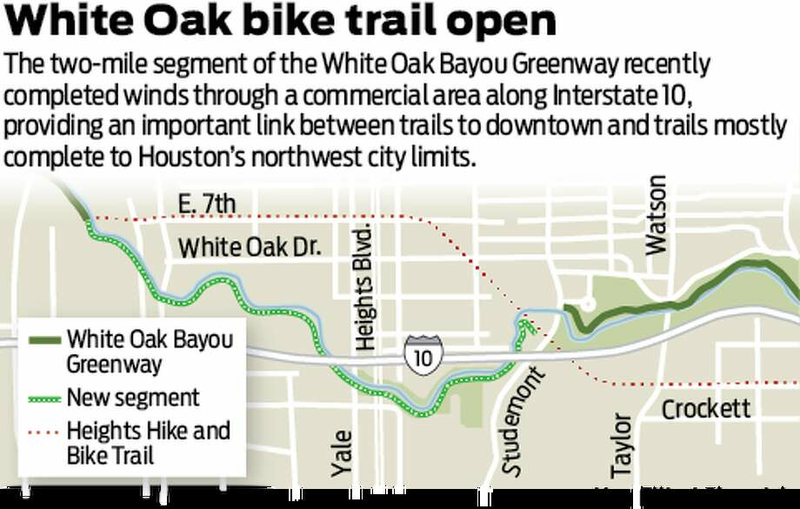 Part of the parks board’s Bayou Greenways 2020 efforts, the new segment of the White Oak Bayou Greenway runs from Studemont Street and the Heights trail to the T C Jester trail. The new two-mile section – minus an unfinished spot below Yale Street – extends the White Oak trail to about 11 miles, making it the largest continuous portion completed thus far. By mid-2017 that will lengthen to 15 miles once key connections to downtown and the trail is extended from Antoine to the city limits. Once all of its segments are connected, Brays Bayou Greenway will be the longest of the trails at 30 miles, from the Houston Ship Channel to Eldridge in far west Houston. “I really do believe Houston is at such an exciting point in the public realm,” said Beth White, the parks board’s president. White, who took over the nonprofit nearly six months ago, moved to Houston encouraged by the “vast” opportunity to develop a large-scale trail system. I’ve been watching this go in – you could see the progress of the construction from the I-10 service road as you approach Studemont – and I plan to give it a ride in the near future. The one thing that is unclear to me at this time is whether it connects to the Heights trail, which among other things would connect it to downtown. There’s a separate trail that begins in front of Stude Park and takes a different route into downtown, but this new one stops a little short of that, and would need a bridge across the bayou to make a connection. It’s a good addition to the area, and will provide a non-car means of local travel for folks in the new housing being built on Studemont across from the Kroger. Residents have seen and heard speculation and rumors for months, wondering what the fate would be regarding H-E-B’s potential Heights move. Well wait no more. After the rumor mill ran wild following the No-Dry Vote petition spearheaded by H-E-B and the Houston Heights Beverage Coalition earlier this year, president of the company’s Houston region Scott McClelland confirmed to The Leader in an interview that the company plans to open its new location at the site of the old Fiesta in the Heights, should voters elect to make that area “wet” in November. The official site announcement took place at the old Fiesta location on 23rd Street and North Shepherd Thursday morning. A permanent move into the Heights remains predicated on the No Dry Vote passing, and it appears H-E-B as well as the Coalition are confident in its future success, as evidenced by Thursday morning’s proceedings. Advocates such as Heights resident, local attorney and chair of the coalition Steve Reilley told The Leader in September that opening an H-E-B within the Heights would provide a boon for the economy along with the diversity in shopping options. “There are a lot of people who would like to have a big grocery store within walking distance because they don’t have transportation or would like to have a job they can walk to in the Heights,” he said. McClelland’s recent inboxes seem to say as much. “Over the last five years I’ve probably gotten more requests for a store in the Heights than anywhere else in Houston,” he said. See here for all previous blogging on this topic. The former Fiesta site has been talked about as a potential HEB ever since the original store was sold and demolished. As noted, this is all predicated on the dry law revision being passed. KUHF addresses that. In August, the City Council voted to place a referendum on the ballot to lift the ban on the sale of beer and wine for off-premise consumption. Steve Reilley leads the Houston Heights Beverage Coalition, which collected more than 1,700 signatures on a petition to overturn the ban. He, together with city council members and representatives from the retail industry, kicked off the official campaign for a yes vote. They’ll have to convince at least half of the estimated 10,500 voters who live here. Considering there is no organized opposition, this sounds like an easy task but Reilley says they’re not taking it for granted. He says there’s also some misinformation about what the ordinance would do. It doesn’t repeal the original law that established the ban but merely allows for beer and wine to be sold in stores. 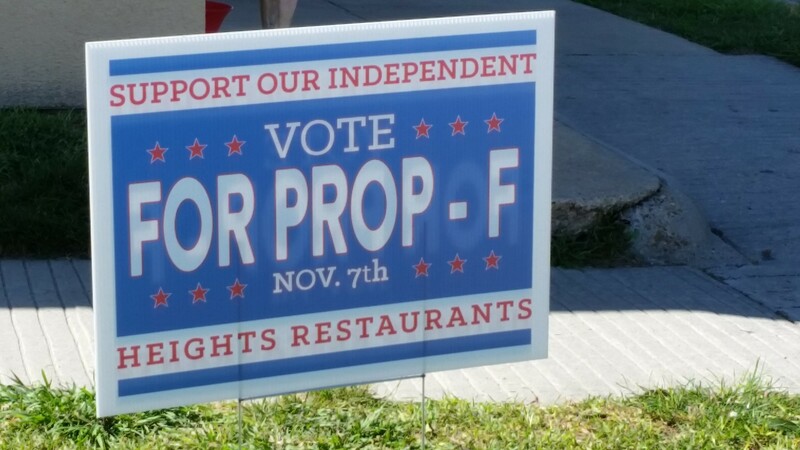 I don’t know about organized opposition, but I have seen one yard sign advocating a No vote, so someone is working against it. I make the referendum a favorite to pass, but it’s unusual enough – and this is a weird enough year – that I wouldn’t feel too confident about that. The Chron, Swamplot, and the Houston Business Journal have more. The item will be on the ballot, pending Council approval. City Secretary Anna Russell confirmed that the Houston Heights Beverage Coalition gathered 1,759 valid signatures for its petition submitted last month, 248 more than required by law. 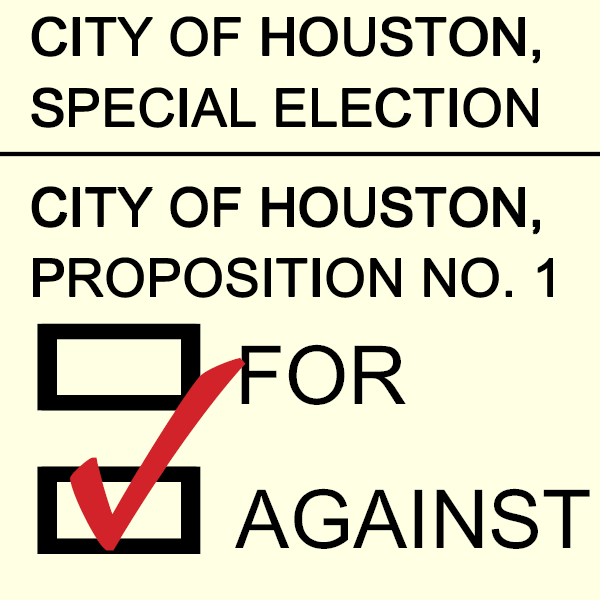 The Houston City Council is now slated Wednesday to formally call the election for Nov. 8, as required by state law. The ban predates Prohibition. It first went into effect in 1912 and was kept in place when the Heights was annexed into Houston in 1918. If the ban is lifted, residents would be allowed to buy alcohol at grocery and convenience stores. The change would not affect alcohol sales at restaurants. See here, here, and here for some background, and here for my interview with Steve Reilley, who led the petition effort for the Houston Heights Beverage Coalition. I should note that the petitions specified “off-premise beer and wine sales”, so hard liquor would still not be available for purchase within this zone. As is always the case with dry areas, there are two liquor stores right outside the zone – they’ve been there for as long as I can remember – so no big deal. The ballot proposition has now been approved by City Council, so it will officially be there. Only people who live in the historic dry area will have this item on their ballot, so administering it ought to be interesting. There is definitely some opposition to this, and as it is an affluent area I expect a fair amount of money to be spent by both sides between now and November. I consider the change effort to be the favorite to win, but anything can happen. The Press has more. In which we learn there is indeed some opposition to this effort. A petition favored by grocery giant H-E-B to partially lift a 104-year-old ban on beer and wine sales in a dry part of the Heights could be headed for a vote this fall. The Houston Heights Beverage Coalition, which was formed to push the effort to allow sales for off-premise consumption, reported it gathered more than 1,700 signatures in 21 days. By law, the coalition had 60 days to collect a minimum of 1,511 signatures. The measure now is awaiting certification by the city secretary’s office. H-E-B, which has expressed strong interest in establishing a store in the area, gave proponents a boost by working with Austin-based political consulting firm Texas Petition Strategies for the signature drive. Opponents say the ban – put in place shortly before Prohibition – has kept the neighborhood family-friendly and helps guard against unwanted development. A change could alter future development, local resident and real estate agent Bill Baldwin warned. The Houston Heights Association has not taken a position on the ban, he added. There is a Kroger in the dry area at West 20th and Yale. By contrast, the Kroger on North Shepherd at 11th Street is in a wet area. It recently opened an in-store bar that sells draft beer and wine. Kroger is not participating in the petition effort. Baldwin said such nearby access makes repeal unnecessary. He said the movement comes from people with commercial interests in a change. See here, here, here, and here for the background. I personally find the argument espoused by Baldwin to be specious. Even if this effort could lead to liquor stores being opened in the Heights – which as we know the Beverage Coalition denies – it strikes me as unlikely that anything but a high-end place could afford the rent. I figure the amenities that people like about the neighborhood include things like walkability and good schools, and I rather doubt that an HEB would be seen as a negative. That will be a discussion for the campaign, assuming the City Secretary validates that there were enough signatures turned in. We should know that soon enough. As I said, there is definitely some opposition to this, as well as some enthusiastic support, but as yet I am not aware of an organized effort to oppose the ballot measure. When I do learn of such a group or organization, I will reach out to them for an interview as well. What are your thoughts on this? Of primary interest to the folks in my neighborhood only, though I will note that as Mayor Turner has made it easier for neighborhoods to request traffic-calming measures like speed cushions, this could be in your future as well. Tonight at 7 PM there will be a public meeting in the cafeteria at Hogg Middle School to discuss the very-hotly-debated neighborhood traffic management plan (NTMP) for the Woodland Heights. A copy of the letter sent to residents about the meeting is here. A map of the affected area is embedded in this post and viewable in larger form here; a larger version, from the back of that letter than I scanned and uploaded, is here. An FAQ for residents who haven’t been following this as closely as some is here. As I understand it, there are three main issues: People speeding on Pecore, people not slowing down at the school crossings at Bayland and Helen and at Bayland at Morrison, and cut-through traffic on Watson and Beauchamp, both of which provide alternate routes to the freeway exchanges at I-10 and I-45. There’s a lot of concern that the forthcoming changes to I-45 in the area will create incentives for more cut-through traffic, and this is designed to remove those incentives. You may or may not care for the solutions being proffered, but this discussion has been going on for a long time and there have been plenty of opportunities to have your voice heard. None of what is being proposed should come as a surprise. If you have anything further to add, tonight at 7 PM at Hogg Middle School is your chance to add it. The Chron is rooting for that petition effort to change the alcohol rules in the historic Heights. Today, sitting down in some of the restaurants in the Heights is like slipping through a wormhole into a bygone era when respectable Texas businessmen carried flasks of whiskey in their pockets. Waiters invite you to sign up for a private club – wink, wink – whose card-carrying members are allowed access to the establishment’s stash of demon rum. Now, if a modern-day neighborhood reform movement succeeds, this quirky rule banning booze sales in the Heights may finally be amended. Something called the Houston Heights Beverage Coalition has started collecting signatures on petitions calling for a referendum that could allow stores in the Heights to sell beer and wine. And it’s about time. Nothing would change for bars or restaurants, which would still have to live with those archaic Prohibition-era restrictions. And package liquor stores would still be forbidden in the old neighborhood. The new rules would apply only to selling beer and wine that shoppers would carry out of stores and drink somewhere else. Still, we hope this proposal for a limited rollback of Prohibition in the Heights succeeds, because this area’s booze ban has pointlessly shackled retailers and inconvenienced consumers who don’t even drink. These antiquated restrictions on alcoholic beverage sales are a major reason why some people who live in the Heights have to drive out of their way to buy groceries. 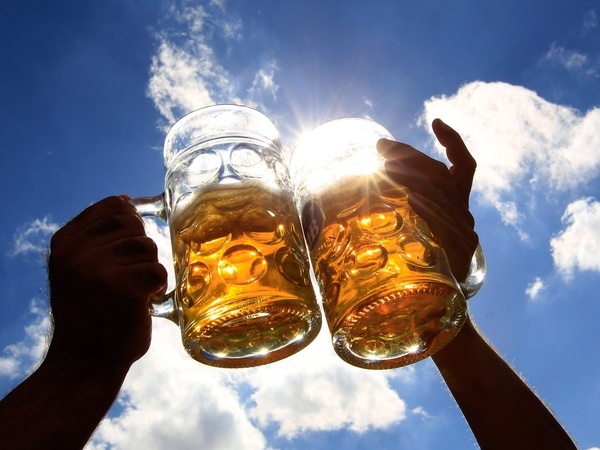 Beer and wine sales are a crucial source of income for grocers, an industry scraping by – according to data from the New York University Stern School of Business – on net profit margins of less than 2 percent. Although a comparatively small Kroger store survives in the Heights without beer and wine sales, expanding supermarket chains have conspicuously opened new stores outside the boundaries of the Heights. See here and here for the background. If you’ve followed this blog for awhile, you know that as a rule I support efforts to repeal Prohibition-era anti-booze laws. This effort is no exception – I’d sign the petition and vote in favor of the ensuing referendum if I lived in the affected area. There’s no good argument against allowing a grocery store to sell beer and wine in this part of town. I can’t help but think that this referendum effort is going to walk through a minefield of legal technicalities just because it’s such an oddball situation, but I say take them as they come. I wish the Houston Heights Beverage Coalition PAC good luck in their quest. With the intention of building a new store in the Heights, H-E-B said Wednesday that it has been working with a political consulting firm in Austin to help change a law precluding beer and wine sales in a dry part of the historic Houston neighborhood. The grocer said it has contracted with Texas Petition Strategies to collect signatures needed to secure a place on the November ballot where residents can vote to make beer and wine sales – for off-premise consumption – legal. The effort has led to a petition drive by a group called the Houston Heights Beverage Coalition, which has been seeking some 1,500 signatures needed. H-E-B spokeswoman Cyndy Garza Roberts said a location in the Heights has been identified, but the company is still in negotiations on the site and commenting on specific details would be premature. “We definitely want to be in the Heights, but in order to do so we need to make sure we provide those customers with the same quality products that they’re able to find at our other stores,” she said. The group has 60 days to gather the signatures from residents who live in the area formerly known as the City of Houston Heights. Once the signatures are gathered, they will be verified by the City Secretary with Houston City Council then calling the election for November, according to a news release. The signatures are being collected by a door-to-door effort and they can also be signed at area establishments, including Coltivare and Revival Market, said Hatch. The coalition has secured more than half of the signatures needed. See here for the background. The one thing I know for sure is that a lot of Heights residents have been hoping for an HEB to be built in the neighborhood. I’d recommend playing that angle up, both in the signature-gathering and the election itself. I’ll be interested to see what if any opposition arises to this as well. Given the November date, turnout won’t be an issue. A GROUP CALLED the Houston Heights Beverage Coalition PAC is hoping to bring about a vote on allowing beer and wine sales in the technically dry section of the Houston Heights. The group published a notice on May 5th announcing an application to the city to start collecting the petition signaturesrequired to get the measure on a local option ballot. The group’s immediate goal isn’t to do away with all alcohol restrictions, and the proposed ballot measure wouldn’t get rid of the current private-club workaround frequently employed by area bars and restaurants. But the proposal would lift existing barriers for stores trying to sell beer and wine to becarried away elsewhere — an issue that forced the recently closed Fiesta Mart at N. Shepherd and 24th St. to install its traditionally-in-the-parking-lot Beverage Mart a full 4 blocks away on the corner with 28th St. (across the northern boundary of the zone). Here’s a map of the dry area, which hasn’t slowed the proliferation of places to dine and imbibe in the Heights. Many of them are east of Oxford, which puts them outside the zone. Others, like the Down House, do the “private club” dodge, while Torchy’s on 19th inherited a grandfathered license from a defunct icehouse. When I first read this story, I thought it would be about repealing the ban for eateries and drinkeries, but apparently not. The Press has since given some clarification about who and what is behind this. H-E-B is one of the grocery store chains that are eyeing building a store in The Heights, but nothing definitive has happened on that yet, according to Swamplot. We asked Reilley if H-E-B was one of the members of the Houston Heights Beverage Coalition. “I believe they have definitely expressed interest in it and they’re definitely going to support this,” he said. “It is my understanding that if it passes, they are going to very likely move into The Heights. To that degree, yes, they’re part of it, and I believe they will be part of it going forward.” We left a message for H-E-B’s director of public affairs in Houston to see if the grocery store chain has any comment, and will update this article if we receive a response. Reilley said other grocery chains are part of the special interest group but said he wasn’t able to confirm that. He referred us to John Hatch of Texas Petition Strategies of Austin, a company that has been hired to oversee collecting signatures and, if the issue makes it onto the ballot, stumping for a passing vote. We left a phone message for Hatch but have not yet received a call back. I gather from recent activity on the Heights Kids message board that people have been out knocking on doors to gather petition signatures, with an aim of having something on the ballot this November. I also gather that some folks are not clear on the details of this issue – specifically, why part of the Heights is “dry”, what exactly that means, and why there needs to be an election to change it. That may add to their challenge. A this subsequent comment notes that there are some potentially tricky legal issues involved as well, meaning that however this shakes out someone may wind up suing over whatever the result is. Any lawyers in the crowd want to comment on that? In any event, we’ll keep an eye on this. I live outside the “dry” zone, so I (presumably) wouldn’t get to vote on this. If you’ve been asked to sign a petition, leave a comment and let us know. More here from Swamplot. October 2015 was the last update … it’s now May 2016 … several things have changed in the past 8 months. As a quick summary, TxDOT will be rebuilding I-45. This will be a massive project that includes rerouting I-45 downtown by abandoning most of the Pierce elevated and routing I-45 below-grade next to I-59 by George R Brown Convention Center. 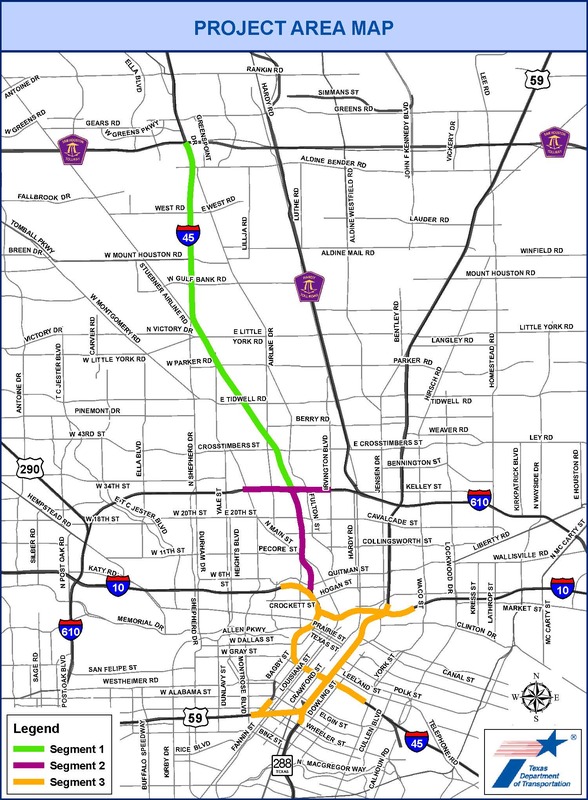 There are 3 Segments involved in the project – Segment 1 (610 to Beltway 8);Segment 2 (610 to I-10) and Segment 3 (the Downtown Loop). We are currently in year 11 of an approximately 12 year planning phase … prior to shovels hitting the ground for 4-6 years of construction. TxDOT has held 4 public meetings so far, the last one in April 2015. The next meeting will be a public HEARING (much different than a meeting) in late fall 2016 … probably October or November 2016. This will be the last opportunity for the public’s voices to be heard before construction begins! Comments received during the Public Hearing will be considered, then a ‘Record of Decision’ (ROD) will be issued & construction will begin (when funding is secured). I am part of the I-45 Coalition, which is an all-volunteer group that was formed to address issues related to the planned construction of I-45 and to work with TxDOT to ensure that the pending construction comply with these 3 tenets: (1) No expansion beyond the existing right-of- way (2) Alternative means of transportation must be explored (3) No negative impact on the neighborhoods quality of life. Well … #2 has never been explored, #3 is yet to be determined & #1 was initially going well, but has changed recently. North St. Bridge – This will be gone. No vehicular bridge. No pedestrian bridge. The main I-45 roadway will be raised to almost grade level at North St. so there will be no way to have any bridge there. The I-45 Coalition will keep you updated as plans progress. It will be critical to attend the Hearing, when it is announced. The project is on a short fuse now… please stay involved! See here for the last update. I’ll be sorry to see the North Street Bridge go, but I can’t claim it’s highly trafficked. Mostly, I hope that Mayor Turner and the various people who represent this area are staying on top of developments and expressing their own concerns and opinions to TxDOT. Remember, there are other possibilities. I’ll keep an eye out for an announcement about that meeting. In times of change, there are always opportunities to do well. To recycle their glass, Houstonians now must go to recycling centers to drop off their used bottles. “People have to drive all over,” Pan said. Pan and his brother-in-law, David Krohn, 28, now run a company they call Hauling Glass. They go door-to-door collecting glass bottles that the city’s new curbside recycling agreement leaves behind. They now serve more than 160 households in three inner-Loop 610 ZIP codes – 77007, 77008 and 77009. Requests from residents in those Heights-area neighborhoods in the three ZIP codes and inquiries from outside those areas are flooding the business email account and phone line, they said. Pan and Krohn also are learning logistics lessons from their fledgling business. Once every two weeks, they rev up a white 1977 Jeep Wagoneer and roll through neighborhoods to clients’ yards, staggered by ZIP code and day of the week. They leave their loads in an industrial-size bin and warehouse just east of downtown. They’re working with major glass-recycling businesses to take the glass from there. By picking up glass only, Krohn said they’re adding convenience for households and eliminating any extra processing those companies would have to do. Live long and prosper, sir. Three words: Find alternate routes. There’s about to be a lot of yelling about Yale Street, as the historic span makes way for a modern replacement. Crews will close the bridge carrying the road over White Oak bayou on April 18 to prepare for demolition. For the next 20 months, drivers in the area will have to do without the segment of Yale. Signs warning motorists were installed recently by the Texas Department of Transportation, finalizing that construction is imminent. Detours are planned, but many drivers are expecting to avoid the area entirely. The bridge, built in 1931, is one of seven bridges in Houston listed on the National Register of Historic Places. Though the designation doesn’t save the bridge, it does require a more meticulous process to replace it. The bridge has been a source of discussion for years, as commercial development south of it has increased. TxDOT nearly closed the bridge in 2012, when trucks weighing more than 3,000 pounds were restricted from using it because of structural concerns. The last update I have on this is from July of 2014, so no one can say this has been rushed. At least the construction on Shepherd is almost finished, so that will serve well as an alternate route. If you’re the type that blows a gasket when you get stuck waiting for a freight train to pass, though, your only option with an underpass is Studemont. This is going to be a long 20 months. Swamplot, which was first to have this, has more. A popular piece of public art is looking for a new location. It’s difficult not to smile while driving east on I-10 when passing the “We Heart Houston” sculpture near the Patterson St. exit in the Heights. Since 2013, the colorful, 20-foot-tall work has been a great sight for those with pride in Houston. However, the sculpture’s days there are numbered. The good news? Houston is getting a larger, more substantial sculpture touting our arts scene in its place. “Art is Everywhere Houston” is on the horizon, and promises to make an even greater impact. The “We Heart Houston” sculpture’s new location is currently under consideration according to the artist, 89-year-old David Adickes. A prolific and treasured local sculptor, Adickes has numerous larger-than-life works to his credit including “Virtuoso” at the Lyric Center, the enormous President’s Heads, and the 76-foot-tall Sam Houston on display on I-45 in Huntsville. Adickes is working with the Houston First Corporation to review options. Houston First is the agency charged with enhancing the quality of life in our city, as well as advancing economic prosperity, and the city’s image with the world. Well, not exactly perfect, as it turns out. The portion along Buffalo Bayou chosen for the sculpture routinely floods. Decision-makers concluded that it was only a matter of time before a photograph of a half-submerged “We Heart Houston” sign saturated the internet – not exactly an image the city wants to project. ‘My next choice of locations is on the jogging path as it runs near Stude Park in the Heights. People could still see the sculpture from the street as they drive by, and it would lend itself to joggers and people in the park taking selfies. That’s another good solution,” stated Adickes. Sounds reasonable to me. As you know, I’m a longtime fan of Adickes’ work, and my kids love this particular piece, so I’m glad it will be moved to a place that is safer and more convenient for taking pictures. I feel confident it will be making an appearance on my Facebook wall in the near future. The Durham/North Shepherd strip, from about 11th Street up, has largely been immune to the implacable Heights-area gentrification machine. That may be about to change. One of the oldest Fiesta stores is closing at the end of this month, leaving a large Inner Loop site potentially available for redevelopment. The store at 2300 N. Shepherd is closing for “business reasons,” a company spokesman said Friday. “It’s an older facility, and we just felt like we could invest the money wiser on some of our other stores,” said Fiesta Mart’s David de Kanter, who believes the store may have opened around 1974. The grocery chain was founded two years earlier by Donald Bonham and O.C. Mendenhall to cater to Hispanic shoppers. The building spans nearly 68,000 square feet on a roughly 4-acre property in the northern Heights area, where old industrial and retail properties are being torn down or renovated to make way for trendy restaurants and high-density housing. Some of that is happening, but on the smaller streets, not on Durham and Shepherd, which are still mostly a collection of car lots, self-storage places, and small businesses. Outside of the one square block between 19th and 20th, these two thoroughfares haven’t changed much at all in the almost 20 years I’ve lived in the Heights. The closure and sale of this Fiesta, which sits on a huge piece of land, represents a unique opportunity for change on a big scale. Whether that happens or not depends in large part on what this property gets developed into. I look forward to hearing what the plans are.